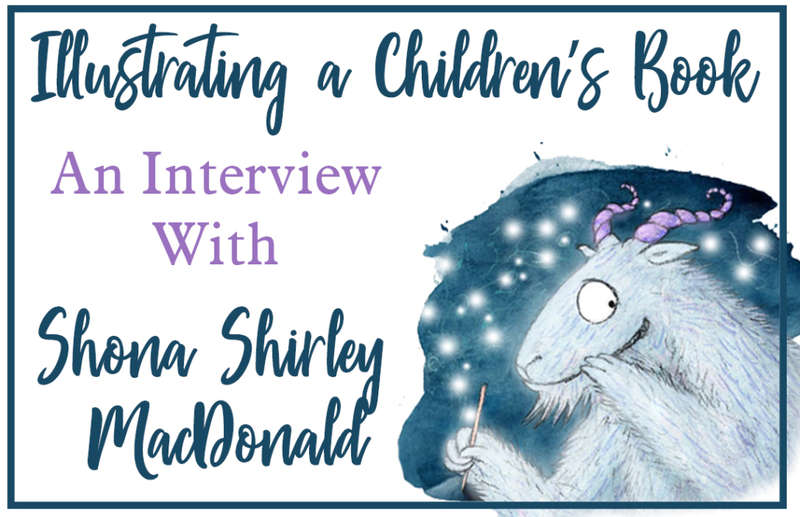 Have you ever stared at the shelves and shelves of wonderfully illustrated children’s books in bookshops and wondered how they are made? 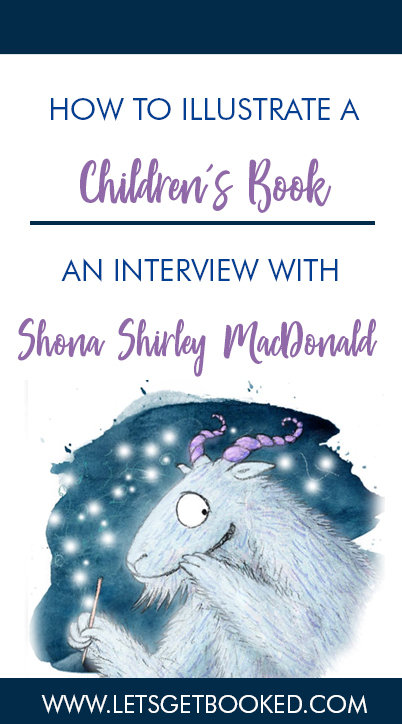 Today I have author and illustrator Shona Shirley MacDonald on the blog to talk about how she wrote and illustrated her new book, The Pooka Party. Can you tell us a little bit about the inspiration behind the story? I’ve always loved folk and fairy tales, and mythological beasts. So I wanted to create a story with a fantastical creature at the forefront. The Pooka (or Púca) is quite a varied beast –sometimes helpful, sometimes menacing, and it can shape-shift and tell prophecies – so there’s plenty of wriggle room for embellishment. The stuff about loneliness and the party are fairly autobiographical. I do like to spend a lot of time on my own, but when I suddenly realise I want to see my friends and family, it can be difficult to get in touch. Though I find it is always worth it when I do. The illustrations in The Pooka Party are beautiful. How did you “find” your style? Thank you, it has been a long process, especially since I specialised in stop-motion animation at art school, not illustration at all. Of course, I was always drawing anyway, but drawing and illustrating are not the same thing. I used to worry about not having one style because there were various things I wanted to do, and I couldn’t see how they might amalgamate. When I had an internship at West Highland Animation, and then worked on two comics for them, I started blending traditional and digital techniques and layering things together. Then I used that way of working and developed it a little further when I created my solo exhibition Juniper. I still like working in different ways, so maybe my style isn’t finished developing yet, which is a good thing I hope. Looking back I would say it’s not something to worry about, just keep working away and trying techniques that you find interesting. Did you find it easier to illustrate your book because you’d written it yourself? I don’t think so, unfortunately! At the end of the day, it’s still a visual problem to solve. I did write it so that I could draw things I wanted, however, like lots of creatures and cake, and the impossible contraption that is the computer. Can you tell us a little bit about your illustrating process? How do you go from idea to the finished page? I started with a mixture of sketching, reading, and writing. And then lots of re-writing and drawing and cutting things up and sticking them back together again. My Mum is a picture book expert so I showed her the first draft and got her feedback, before sending it to a few other friends and family. And then I got differing views, which was confusing, so I left it for a while and came back to it. It was a long slow gradual process. The version I proposed to The O’Brien Press had very rough sketches, and two pages fully coloured. After that, it was a case of working with Emma and Susan from the publisher to finalize the text and layout. Then the slow process of doing all the final drawings and the colouring. I found the colouring quite difficult because at that stage everything else was already set. I might do things differently next time. My partner was a huge help, he’s an artist as well and I really valued him having a look at the work with fresh eyes. What advice would you give to an illustrator that would love to work on a children’s book? Do it! The right project doesn’t always come along when you want it to. In that case, make it happen yourself. No-one can see what’s in your head – you have to create it first and show them what you can do. I would recommend getting the Children’s Writers’ and Artists’ Yearbook, as it is packed with information and lists publishers and agents. It tells you what they’re looking for and how to contact them. Of course you can also simply search online for publishers and agents and check their submissions section. You needn’t limit your search to UK & Ireland, there’s a whole world out there and maybe publishers from other countries would love your style even more. Who knows? Try not to get disheartened if you’re knocking on the door and no-one is answering. Your hard work will pay off, and if you keep looking for opportunities, showing your work, and making work you love, then something will come along. I think one of the hardest things is focusing on one project and sticking with it to the end, unless there’s a deadline. I don’t have an answer for that one, as I’m still trying to figure out how to manage my time better myself. Also, join the AOI, they’re a professional organisation and there to help promote and support illustrators. They know what they’re talking about and if you’re a member can help with pricing and contracts and the horrible business-side of things that are daunting when you start out. (and even afterwards!) Additionally the IGI in Ireland are great to be a part of. Thank you to Shona for these really insightful answers! You can find out more about her by visiting her website. Her new book The Pooka Party is available from Amazon and other bookshops now. If you find this interview helpful. Please pin the image below on Pinterest.